In some version of the Thoth deck there are three images for the Magus. You can see them here http://taroteca.multiply.com/photos/album/99Labelled The Magician, The Magus and The Magus. They were never intended to all be used at the same time in the deck. The publishers had the slots for two more cards when making up the deck and decided to include these two extra discarded versions of the Magus for interest. Gerd Ziegler in his book ‘Tarot: The mirror of your relationships’ Labels the three cards as three aspects of the Magus and suggests the possible use of them all. I personally have found it excellent to have the three included in my deck and find it really adds some power to the readings to have two cards that lean strongly to the positive or negative where the other cards are so much more balanced. The Magician is seen as the White magus and embodies all the qualities of the positive magus, communication for the good of all. The focus on the light exclusively, open and honest communication, no lying or manipulation just the truth as the person sees it. The Magus with the figure balancing on a tightrope type image is considered the Transcendental Magus and is the card Crowley intended to be used in the deck. This magus has the powers of dark and light at his disposal and actually is not thinking about whether something is right or wrong to do – it is like he has transcended duality and so can used things that on the face of it would be seen as manipulative but are ‘right’ for him to use as this is his pathway forward when viewed from the spiritual standpoint. The Other magus with the dark figure behind is considered the Black Magus and this card represents going against the will of the whole. Fighting against ones path and basically is a ‘no not this way’ It can also come up in situations of abuse and manipulation, difficult relationships where there is a power difference that needs to be addressed. It can also point to someone who has found themselves so keen on a particular outcome they have begun to try an control people and events too much. Sometimes just realising you are trying to control things and releasing your control to a higher energy can release the difficulties in a situation instantaneously. So this card is powerful when it comes up and brings with it a lot of healing and also trust and faith in the higher processes that go on in our lives. The caduceaus in the front of the main character I feel indicates healing is possible from abusive situations and they can be released from having power over the person any longer. I feel it also represents situations where you are feeling controlled by someone from your past and are finding it hard to break free from that conditioning, whatever you try it seems so hard to actually control your own patterns – paradoxically the feeling of controlling others and situations that are out of their control, helps you feel you have control over life which basicially feels out of control either in the present or the past. As this awareness comes to us we are able to then address the situation and start to look to higher planes and trust that our highest path will be shown – that the way we think we have to go is actually full of the hard work of swimming against the current and is not a productive way for us at the time. We change our direction when we get this card and let go – allowing something else to come in its place, perhaps another has the answer we seek and we haven’t been listening, perhaps we need to allow our intuition to have more space. Perhaps we need to leave a relationship rather than stay to make it work. Perhaps we need to view things from a higher perspective. For those that only have the one card in the deck, then this card can embody these concepts both the dark and light depending on the position in the reading and also your intuitive understanding of its message at the time. 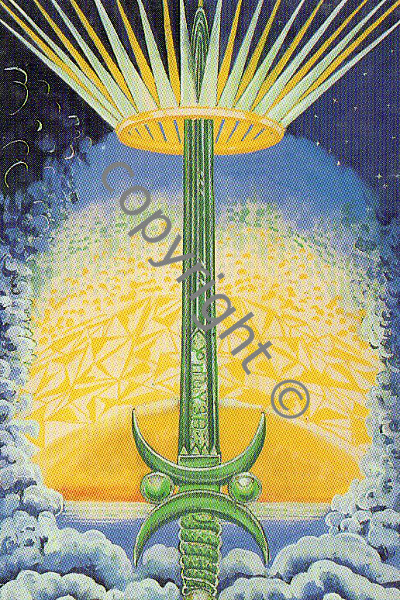 This month’s card for you all is the Ace of Swords. 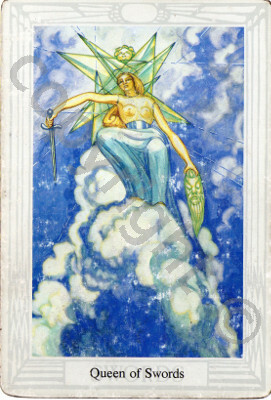 This card is an ace and as such representative of new beginnings in general – being the suit of swords then this beginning would be on a mental level, and is associated with air. You can tie this with new plans, turning over a new leaf and making clear decisions about your future – where you want to go, what you will need to do to get there and setting your intentions. All creations and activities begin with a thought and this card is about getting clear in your thoughts and as you do so the path before you opening up and becoming clearer too. 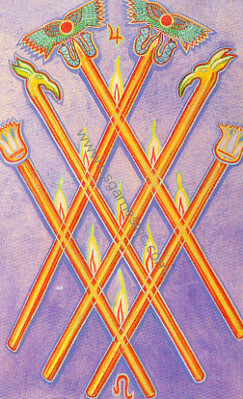 As you look at the card we have a sword pointing up towards the heavens, you can see this as the sword of discernment, the sword which will allow you to cut away the options that are not for your highest good and to embrace those that will carry you forward in your life in a positive growing sense. The sword can be seen to be focused on this highest plane as it points upwards, and this indicates that will to create the highest reality on Earth that you can at the time. We can see it coming out of clouds – leaving behind confusion and doubts, the air clears and the truth can be seen and known and once the truth is revealed then decisions become a lot easier to make about your next steps. The sun in the background a reminder that it is a new day and new beginning and also that the day begins from a place a high self-esteem, self-love and confidence. This card often appears after a time of worry or confusion and when you have going round and round in your mind for so long you are now able to make a clear decision – your self-confidence increases as a result of making the decisions that are necessary. Speaking the truth to those who need to hear your point of view. Clearing the air in cases of conflict and allowing you to be free of any entrapments and able to walk your path forward on your own destiny rather than anyone elses. I see the crown around the sword as spirits crowning and support of whatever you decide at this time, as you use your intellect to make the decisions needed and put your intention to spirit then spirit can respond by setting the wheels in motion to create your desire. It is a good time to write a list of the qualities of the type of life you are trying to create, type of event, or type of relationship as you get your own intellectual mind clear about what you are wanting then you also send a message to spirit and allow things to take the direction you intend. Our intentions are more powerful than you can image, our intentions shape the life that unfolds before us, when we are not clear then the results are also not clear as we become discerning and focused we also set about the energy to create clear and focused outcomes in our future. The symbols on the sword are the word of the Law, the sword is the one used by the magus in magical rites of creation and the snake of the handle is the energy of transformation that flows through the discerning sword as it cuts away the unchosen and illuminates the choices made to bring the required change into being. IT is however the beginning of the journey and not the result or harvest of your dreams and desires, you are setting things in motion but much may happen on the journey to creation being complete. This card however does have you setting off with a good start.